In the first of a series of reviews covering titles featured in the Disney Afternoon Collection, we'll be looking at Duck Tales. I'm not yet sure how many of the games on the collection that I will cover, as I may not have enough to say about some to justify writing a full review. I guess it'll just be a nice surprise. Without further ado, here is Duck Tales. The NES era is what many consider to be a golden age for Capcom, licensed games, and the 2D Platformer. Capcom was pumping out great title after great title on the system; the Mega Man Series, Little Nemo, Demon's Crest 2, Bionic Commando. Not to mention the publisher's work on Disney properties. In the midst of this renaissance, Capcom released Ducktales. Duck Tales is considered a genuine classic and it's not hard to see why. 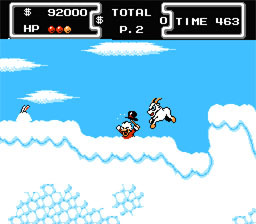 The game is designed around an interesting pogo mechanic wherein protagonist Scrooge McDuck can use his cane to bounce off of enemies, hazardous terrain, chests, or plain old ground in order to get a boost. This feature is used to good effect, creating moments where the player is able to build up a nice sense of flow as they alternate between regular jumps and pogo jumps to negotiate the obstacles before them. It feels satisfying to hop through segments that would be more troublesome for less versatile heroes. The soundtrack is a certified classic in and of itself, featuring upbeat tunes that mesh well with Scrooge's floaty controls. From the classic Ducktales theme, to original songs, there isn't a dull song. The track from the moon stage is a particular highlight, developing its own reputation as one of the all-time greats among chiptune music. The soundtrack is well done on its own, but works even better within the context of the game. Despite the praise I'm able to give for the individual components of Duck Tales, these pieces aren't able to coalesce into a whole that I find to be particularly great, much less superlative. The levels are kind of generic in terms of theme, the level design itself is pretty plain, and no individual moments within the game stand out as particularly memorable. When I'm thinking about the soundtrack or the ingenuity of the pogo mechanic, I feel like I should enjoy the game more than I ultimately do. It's true that there are some areas of the game that I consider to be lacking (which I'll get to soon), but I think the biggest contributor to this sense of being underwhelmed is a combination of Duck Tales's sterling reputation and "merely" solid delivery. Duck Tales is a good game- absolutely- but it doesn't have enough to take it to that next level for me. Everything it does well has been done better in many other games, including the pogo mechanic. Duck Tales's weakest point is definitely its visuals. They aren't poorly done by any means, but I find them to be considerably lacking. Enemy designs are too simple and don't go together well with the art style of Scrooge or the levels. Meanwhile, the levels' visual design is far too plain for my taste. The Moon and Mine levels are decent, but the other 3 have very little going on. The snow level in particular is just a mass of solid blues and whites, with some black being added in a later on. And the background for much of the jungle level is this solid blue void with nothing going on. Bosses are another low-light. Several use unpredictable patterns that are hard to avoid unless you start to blindly guess which way they're going to move. Visually, they're pretty generic as well. Since the bosses are such a minor part of the experience, their subpar quality isn't a huge deal, but I can't really say that they added to the experience either. Don't take this the wrong way; Duck Tales is an above average 2D platformer and the pogo mechanic is an interesting feature, but I feel like it was put to better use in later titles that I played before Duck Tales. Shovel Knight makes better use of the exact same mechanic, while the Donkey Kong Country series makes rhythmically bouncing off of enemies in sequence much more satisfying on a visceral level. So what makes Duck Tales unique has been done better elsewhere in my book. And once the luster of that wears off, there isn't much to make this anything more than a pretty good platformer for me. But that being said, Duck Tales is indeed a pretty good platformer. It is worth playing for fans of the genre, the NES, or Capcom. Duck Tales is also an important part of video game history, inspiring later titles like Shovel Knight and setting a precedence for quality licensed games. Today, it is a solid platformer that can't help but be lost amidst a surge of other great games in same genre, on the same system, by the same developer. Oh man, Ducktales is such a classic game in every sense of the word. Great music, tight controls, clean graphics and pretty good use of the cartoon license...Capcom really hit it out of the park with this one. I love how there are multiple difficulties to choose from too, so a gamer of any level can enjoy the adventure. Were there multiple endings, too? I seem to recall there were, but maybe my old brain is playing tricks on me. Anyway, great game is great, and still holds up today! I should probably give it another run-through soon. It's been a (short) while since I've done so. I love DuckTales! Both the show and the game, and even after all these years I can still enjoy them almost as much as I did as a kid. Fenton Crackshell will forever be my spirit animal/spirit bean counter. Since they were huge parts of my childhood, I'm bound to feel that you're being a wee bit hard on the game, but I think that even when looking past my own nostalgia it does deserve to be cut some slack here and there, and I actually still think it's superior to most of Capcom's other Disney games on the system. I realize that in today's market there are games that build upon the same gaming mechanics and sometimes improve upon them, but I can't help but feel that it's unfair in a way to compare Duck Tales from the 80's to Shovel Knight from a couple of years ago. Same goes for the general graphics tech; Duck Tales is on par with other NES releases from the same year, even though some stages admittedly don't have a whole lot of detail, such as the Himalayas. Personally I think that even though certain backgrounds may be lacking in detail, it's commendable that they threw in a few different backgrounds/general environments in most of the stages. Being able to go from a lush jungle to a dark cave and up to an ancient temple all in the same stage is pretty ambitious for a licensed NES game like this released back in the day. Sure, this might not matter to someone choosing which game to buy in this day and age, but Capcom could probably not have done a whole lot better at the time with the resources they had. I have to disagree about the enemy and boss designs in general too. Some of them are kind of generic, like the mountain goats or the bees, but I think the majority fit into the Disney style just fine, and some of them are even taken directly out of the cartoon or old Carl Barks comics. 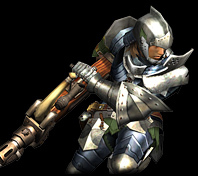 I can understand the complaints about boss movement patterns and battle design, though. The Moon boss in particular can be a bit annoying before you figure out the rhythm of its running around, and/or where to hang out to be as safe as possible, but my main issue with the bosses is that they're not awfully interesting from a gameplay standpoint. There were indeed multiple endings based on how much cash you managed to scrape together during the course of the game. Not exactly any big, epic ending sequences, but they motivated kid me to keep playing well enough. Agreed on all counts. Well said. And thank you for the confirmation/reminder of the multiple endings! Score one for the ol' memory bank! Also I want Fenton Crackshell to be my accountant. I think there were only three endings, right? No money, a chest of money and Scrooge swimming in it or something? Thank you for taking the time to read the review and leave your thoughts! I can absolutely see where you're coming from on all points, but I will explain why I still disagree. I may have came as a bit harsh because I was trying to explore possible reasons that this game didn't click with me in the same way it did for so many others. It ticks all of the boxes for a good platformer, but doesn't really do anything to take it to that next level for me. So when I talk about graphics or visual design, I'm not trying to argue that these are the things holding back Duck Tales from true greatness; just that they may have contributed to the game feeling good instead of spectacular. You make a good point about changing backgrounds throughout the course of a single level, though- that is something I took for granted. He looks out of place both in that level and next to Scrooge McDuck. It honestly feels like they picked him up from another game and dropped him into this one. The design in and of itself isn't bad, but the way his sprite is drawn leaves a lot to be desired. But again, graphics and visual design aren't a big deal when it comes to Ducktales; they're just the part of it that I consider to be the weakest. On the whole, though, they're fine. As for comparing it to later games, I can appreciate that perspective to looking back on older titles. But that perspective is one that isn't true to my experience. When I write about games, I try to make it an exploration of my personal perspective and experience with games. Since I did not experience Duck Tales in a pre-Shovel Knight or pre- DKC time, I can only guess about how I would feel about the game if I had. (As an aside, I actually prefer Duck Tales over Shovel Knight, but I do feel that Shovel Knight uses the pogo mechanic better). I can understand using that perspective for those that have actually lived in that context, but me to trying to speak to that would be speculation. And on a less defensible note, that's just the way I like to write and talk about games. Since I will never be able to go back to a time where I haven't played the games that I have, I don't get much out of viewing games in a purely historical context. I think it is more enjoyable to compare games to each other, see what they do or don't have in common, and see how they may have influenced each other. A game this keeps coming up with for me is the first Zelda. For a kid in the 80's it was probably a blast. But for me, in 2017, as someone who did not play the game as a kid, it isn't particularly engaging. But again, I see the value in that historical perspective, particularly if it is one your own experiences can provide greater elaboration on. I seem to recall the chest of money with gold coins flying out of it, all over the place. I always thought that was the best ending, but maybe I'm wrong! Those aliens are actually IN the show. I can't link to anything right now but look up "Ducktales aliens" and you'll get a hit. In fact, most of the characters (including all of the bosses) are straight from the show. I understand that you and I won't look at the game the same way due to our age difference and the times when we had our first respective DuckTales sessions, and I don't blame you for that at all, I don't mean to sound like I'm trying to poke a hole in your review or anything. I guess Zelda 1 is another great example of how we differ. I still think it's an absolutely magnificent game, and part of the reason why I love Breath of the Wild is that it - to me - feels like Zelda 1 in 3D. Which is meant to be praise, when I say it. Don't mean to go on about this forever, but the somewhat plain backgrounds didn't end with Mario 1 or Mega Man 1; they were still common in 1989 and beyond. Even games like Mega Man 2 had similar backgrounds, in Air Man's stage or the first Dr. Wily stage, for instance. Later Mega Man games did too, to a lesser degree. Capcom probably could have added some extra detail to certain backdrops considering the amount of detail the indoor sections have, but the lack of it wasn't something that was perceived as holding the game back when it was new. It was actually considered one of the prettier NES games at the time. But now we're getting back to the whole age perspective thing again, I suppose. Also, like @ploot says, that guy's actually taken straight out of the TV show. He might have had a different colour, though. Or maybe those aliens came in various colours? That episode is one of the one's I sadly don't have in any format anymore, so I don't recall. Haha, maybe I'm not being clear. I think that alien looks fine on paper. Like, sketch that bad boy out on a notepad and I'll say "hell yeah, that's a Duck Tales looking alien". But the way that character design was translated into an in-game sprite is poorly done. The art style of that sprite does not mesh will with the art style of most other sprites in the game. The alien is fine, but the combination of pixels used to create this representation of the character is lacking. The stage is green, but some parts are so bright that the green metal shines a bright white. But that alien is just a single shade of pink throughout, as if there is not light on him. Oh no, I don't think you're attacking my review at all. I don't need to defend the review because it should stand on its own. And if it doesn't, by all means call that out. Interesting review. I quite like DuckTales, but I'd agree that it's not quite as strong as its reputation might have you believe. My reasons are different though--it feels short to me. Only five stages, and then you have kind of an underwhelming finale where you go back to Transylvania but pick a different path. Since we're talking about Mega Man 1, that game came out in '87 and had around double that number and variety of levels. And its bosses were better too! I also wish the money system was used for something besides points, but that sort of currency system usually didn't make an appearance in NES games. The only thing I really disagree on is looking at DuckTales' pogo mechanic from a contemporary perspective, but like @r_hjort, Zelda 1 is one of my favorite games ever and a big reason why I like BotW so much. But all in all, it was a fun review to read! That sounds right, but I'm honestly not sure. Time for a replay, perhaps! Yeah, Ducktales is a short game. But when you think of all the hidden treasures there are to find, the multiple difficulty levels, multiple endings, and a tough but fair gameplay mechanic, I feel there is plenty of bang for your buck in the ol' cartridge. And the challenge is even greater when you consider there is no "continue" or " password" feature, so if you lose all your extra lives, you're back to square one. 5 (ish) stages is plenty for the game, especially one that came out during the era it did! Aha, now I getcha. I don't necessarily agree that it's a problem, but they could have added a few white pixels as highlights to make the alien sprite less flat. Had to look up the endings, and there are indeed three of them. The one without any money, the one with the chest, and apparently the third one is Scrooge sitting on top of a big pile of gold and coins. Not him swimming in anything, as I remembered it. I'm a huge fan of Carl Barks' Uncle Scrooge comics, DuckTales and the DuckTales game. So I disagree with a lot of this review. You gotta cast yourself back to the late 80s when it came out. At that point DuckTales was arguably the best licensed game ever made for a console, and that meant a lot if you were a 10 year old kid who loved DuckTales and just wanted to play a good game with some ducks in it. The stellar presentation, including the iconic music, helped out immeasurably, too. And I highly disagree with your complaints about the sprites. Those aliens look dope. I also think the Remastered version was a lot of fun, with the chance to hear Alan Young play Uncle Scrooge for the last time (not to mention 97-year old June Foray as Magica de Spell). That's the way I prefer to play it, now. Nice review. I'm pretty sure that I played Duck Tales back in the day, but I don't remember doing it. Which says something, I guess. It's a decent game, but definitely not one of my favorite NES games, even as a Capcom junkie. Now you've got me trying to think of decent licensed games on the NES. I rented them all, and, though I have fond memories of stuff like Rambo and JAWS, I'm pretty sure that they were terrible. Top Gun was okay, I think? And Golgo 13 was hella mature. For all the flack that the TMNT action platformer gets, it was certainly one of the better ones. And there was that Escape From New York game! I think it was called... something Gear? Please don't take this as me being defensive or bitter or anything like that. I'm having fun contrasting our perspectives and explaining where I come from when critiquing games . I guess I get that perspective. But the thing for me is that I did not experience the 80's, and nobody will ever be able to return to them. So what good is a review telling you what a game would have meant to me or you if we played it 30 years ago? What good is a review of Mario 64 that gushes over the innovation of 3D when a majority of readers have been playing 3D games for 20 years? Maybe they can try and cast their minds back to that time when playing the game, but is that how you typically play games? Because that's not really my default mode. Even with games that I played in their time and fully appreciate in their original context, I prefer to look at games through a comparative perspective and see what they have to offer now. So when I say I like a game, it doesn't come with a qualifier of being good for its time. Again, I can see the value of the historical perspective. Especially in something like a retrospective- then it's super important. But that's not how I choose to look at games. I think there's a sense in which we can both be right. I agree that there's no need for someone playing the game today to try to approximate in their minds the conditions of the game's original release. If you can't enjoy the game without all that context, then what use is it to you, other than as an historical document? I understand this. Trust me. I've made that argument about Mario 64 plenty of times on this very forum. But I also think there's some value in understanding a game as an historical document, too. And that was more the context I was trying to supply - just to explain why it was so beloved if you were underwhelmed by it. I mean, I practically explain that in the second paragraph. If I sounded like I was requiring you to put it in context, that's more just to explain why the game is so beloved - why it's still great as an historical document. You can still see flaws in it and understand why it was so beloved in its time. I do suspect I think it's a better game than you do, even in 2017, but that's just an opinions thing. Of course you're entitled to your own opinion. That's just fine with me. That's a really good point about a game being a "historical document". That phrasing made me see things your way. I think I took the "you gotta cast your mind back" part as too much of a suggestion/request/tearful plea. But really you were trying to help me understand why people remembered it so fondly. I took that as guidance for how I should view the game in order to better appreciate it, but that's not what you were saying. You probably do like it more than me. But I also think I like it more than most people who read the review seem to think, so that's probably a failure on my part.